The growing popularity of the cotillon can be traced through advertisements and other mentions in the pages of London’s newspapers, particularly the Public advertiser. The dance begins to attract attention in 1768, although some of the references suggest that it was already being regularly performed at balls before then. (Newspaper references before 1768 have proved elusive, which doesn’t mean that there aren’t any). 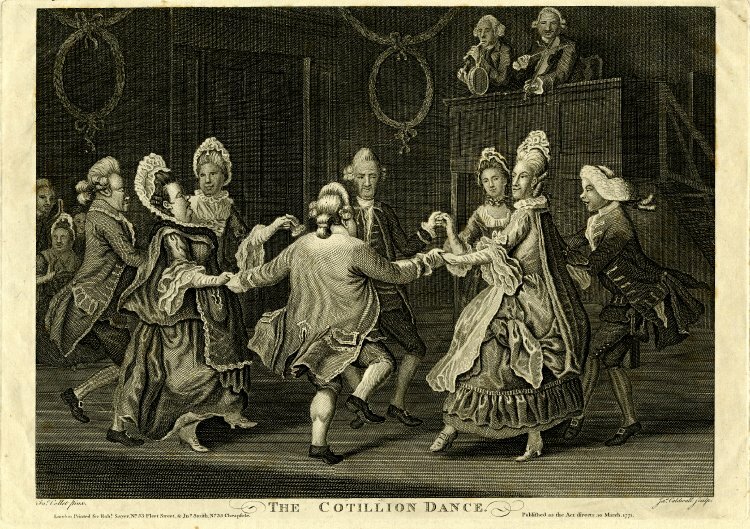 However, throughout 1768 and 1769 the cotillon is quite obviously becoming very fashionable – it’s the dance that everyone wants to do. It appears at least two or three times each month in different contexts. There are advertisements by dancing masters offering to teach the cotillon alongside other ballroom dances, and even regular classes devoted to it. Cotillon music is advertised, encouraging enthusiasts to buy collections of tunes to play for their own private dances at home. Music publishers also printed treatises for those wishing to learn the dance (or perhaps for other dancing masters wanting to teach cotillons). There are critical or amusing letters, most written with satirical intent. Some of London’s leading entertainment venues, including Soho Square and Ranelagh Gardens, provided cotillon rooms – underlining the dance’s importance to paying customers. The craze for cotillons was such that Drury Lane included one among the dances offered between the acts of the plays that were the theatre’s main fare. In due course, I will trace in more detail these various strands surrounding the cotillon. This entry was posted in Country Dancing, The Cotillon on December 22, 2013 by moiragoff.